In September, I was invited to speak in a debate about food and land at the Small is Beautiful festival. This annual event, which commemorates the work of economist and visionary thinker Fritz Schumacher, was held at the Centre for Alternative Technology near Machynlleth and brought together activists, artists, scientists and others to help shape a new future based on development that serves human needs. “Let’s make ‘food as a commons’ a subversive meme (an element of the counter-hegemonic culture that replicates, mutates and spreads from one civic food action to another) to substantiate the transformational narrative to confront the dominant mainstream discourse of ‘food as a commodity’. Let’s make commons food common. Next, Humphrey Lloyd of the Land Workers Alliance, himself a small-scale grower, gave a potted history of land ownership in the UK, covering the Enclosures, mechanization and the Common Agricultural Policy, ending with the fascinating suggestion that if everyone in the UK chipped in with £460, we could put the entire land area into public ownership and create the food system we want. Neils Corfield from the Permaculture Association brought home the perils of corporate neglect of the commons with a beautifully illustrated talk on the impacts of industrial farming on soil, air, water and biodiversity, concluding that ‘food is not a production problem’, and that the big business is engaged in the wrong sort of intensification. Then it was me. I had left myself just a few days to work out how our food values work fitted with the distinction between the commons and corporate control, but I was sure there was the germ of a good idea in there. 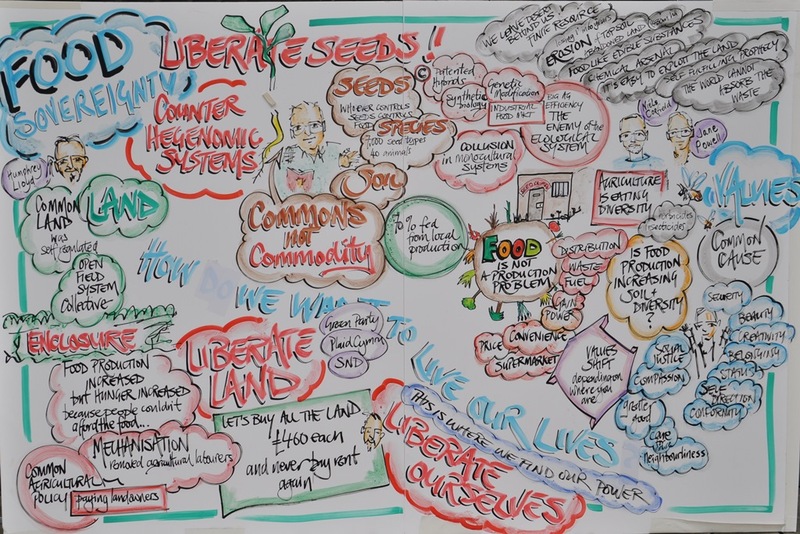 Sure enough, when I thought about the values associated with the two approaches to food, something extra popped out beyond the obvious comment that the commons is about community, benevolence and universalism, while the corporate sector is about power, status and security. The key to finding the positive message is I think in the observation, well documented in the social psychology literature, that our values shift according to the conversation we are having, or the setting we are in. So if we are gardening with friends at the allotment, or we visit a farmers market and talk to the producers, or we share a meal with a community group, we will engage values of sharing, compassion, generosity and benevolence. If on the other hand – maybe even on the same day – we visit a supermarket, with its array of tempting goods, canned music and fluorescent lights, we are likely to focus on price and appearance, and the main values engaged will be those to do with personal gain, security, status and hedonism. This works both ways of course, but it does mean that even the most hardened corporate consumer, once placed in a setting where the ethos of the commons prevails, is likely to start seeing things differently. Picking strawberries, say, on a sunny day with a bunch of schoolchildren makes it that little bit harder to worry about money and whether we are have the latest smartphone. Shopping at a farmers market puts us in mind of quality and provenance, and we don’t look so closely at the price label. So those of us who work in the food commons are actually holding a lot of power: the power to give other people a transformative experience, even a life-changing one. That is important, because it’s easy to despair when we see the size of the corporate food sector. It has shaped the thinking of a generation and seemingly carried all before it. But we need to remember that the corporations only have as much power as the public gives them, and when we demonize them we give away even more of our power, leading to the burnout and despair that can so easily overtake the enthusiastic activist. Maybe we could instead remember that the corporate sector, like the commons, is run by people, and people can always change.